The Burghfield SC 2018 Phantom Open takes place at the club on Saturday 10th November. Online entry is open with discounted entry fee available until 8th November. We are not sharing now so have the water to ourselves this year. Fun sprint racing as usual in our last Southern Phantom Open so hitch up !! The Alton Water Phantom Open Meeting took place on the weekend of October 20th and 21st at Holbrook in Suffolk . Visiting boats were from various clubs but predominantly Creeksea and Fishers Green. The Race Officer, Gavin Johnson made the most of the very light conditions and set 2 races on the Saturday and 4 on the Sunday. The wind was 4 - 6 mph in a south-westerly direction on both days. Both the Saturday races were won convincingly by Ben Fallat closely followed by local sailors Paul Church and Matt House. The 4 races sailed on Sunday were in similar conditions with a few more competitors joining the fleet. Paul Church led for most of race 3 and finished in first position pursued by Graham Dale-Jones and Bob Portway. Race 4 allowed Adrian Coatesworth to achieve his win of the weekend with Graham again coming second. After a general recall in race 5 Bob Portway held onto the lead and Paul was second. Bob was also victorious in race 6. With very tight racing throughout the fleet consistency was hard to achieve, special mention to top visitor graham dale jones who put in a great performance all weekend in his new jj build boat winning the fiercely fought accolade of top creaksea boat. 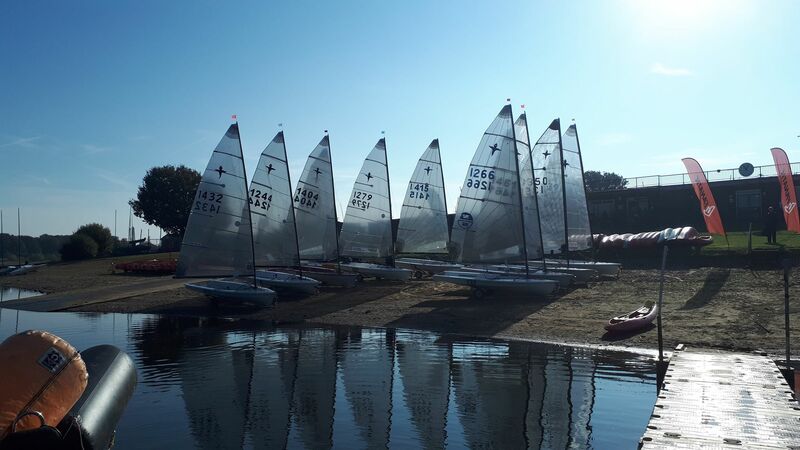 The growing Phantom fleet at Salcombe Yacht Club welcomed 7 visitors for their inaugural Phantom open meeting over the weekend of 6th and 7th October, which served as round 8 of the Southern Travellers Series. In the morning local sailor Alister Morley arranged a rib ride for the visitors around the estuary to view the racing area. Upon their return the reports of the conditions seemed to affirm the forecast of mid 20 kts with gusts of mid to high 30’s. The view of some locals was that in reality, strength was likely to be circa 5 kts less, so 6 visitors with 4 local boats took to the water. Whether it was really 5 kts less is up for debate, and the location of the purported 42kt gust recording remains to be confirmed. Nonetheless, it was windy. After multiple pre-start capsizes the fleet took off up the estuary. Alister Morley led the way to take the bullet, Jim Hopton visiting from Shustoke came in second, and local Paul Ellis was third. Further behind breakages, failures and fear saw 3 boats fail to finish. Following a great first beat leading towards the windward mark, and a cunningham failure for visitor Paul Birbeck of Wimbleball, race 2 adopted much the same pattern as the first – capsizes down through the fleet, and a further 2 competitors heading for the shelter of the dinghy park. Race 2 finished with Alister Morley in 1st, and Paul Ellis traded places with Jim Hopton, to take 2nd. Paul Birbeck, and Chris Biglin of Shustoke came home in the familiar positions of 4th and 5th respectively. Once everyone was back ashore stories abounded of vertical gusts and 45° shifts in the creek, gusts on top of gusts in the main estuary, and the general apprehension of the final run. With some visitors staying in the opposite end of the town from the yacht club, refreshment was required on the walk to the club (and on the way back). There are 4 pubs on the way. We know, we went in them. The Yacht club served up what every tired Phantom helm appreciates – pies, and a free beer generously provided by the event sponsor, Salcombe Breweries - We are Phantom sailors and not scared to stereotype. At this point special mention should also be made of the lengths that the Yacht Club went to, in order to accommodate the special dietary requirements of one helm – namely the need for cheese before bedtime. Barman Jay rustled up cheddar and brie to take away and fabricated some appealingly low prices. Unfortunately they couldn’t supply crackers. And at quarter to midnight nor could The Fortesque Inn, but they did have 4 bags of mini cheddars, so all was good with the world. In the interests of privacy I shan’t mention the helms name. But it does sound like Pieman Fawkes. Sunday was far more pleasant affair. Warm, sunny, but a little shy of breeze. After pumping around to the starting area the fleet were greeted with more wind than anticipated and started race 3 in a full hiking breeze. Simon Hawkes of Castle Cove led at the windward mark, but Alister Morley was determined. The wind eased during the race and made the runs long and fickle, and on lap 2 Alister made it to the front for his 3rd bullet. Simon Hawkes was 2nd and Paul Ellis was 3rd. As the breeze returned, the final race also started in a full hiking conditions. Simon led at the windward mark, and by the time the last boat rounded was several hundred metres down the run. The wind faded. Then filled in again. From behind. Those towards the back of the fleet came charging down the run and the fleet was turned on its head. Only one thing remained consistent – Alister Morley – he went from 2nd to 1st and stayed there. Alister again took the bullet, Paul Ellis was second, and Simon Hawkes Third. By the end of the weekend the visitors had experienced more of the conditions offered at Salcombe than they had anticipated. The hospitality of the local sailors and Yacht Club was outstanding, and the class are looking forward to the second SYC Phantom Open next year. To top off a great weekend, we managed to pair up a Salcombe member looking for a boat, with visitor Ivan Walsh of Shoreham who is looking to upgrade and sell one. So that’s +1 for the local fleet, and hopefully the Southern Travellers Series for 2019. Thanks to the race team, the safety team, the bar staff and caterers, the sponsors, and to SYC for inviting us down. See you all again next year ! The Southern Phantom travellers are heading to Devon next weekend for the Salcombe Brewery Phantom Open. A large turnout is expected to join the six home boats for our first visit to Salcombe. Many are due Friday to get settled in early and there is the possibility of a rib ride Saturday morning around the race area to familiarise visiting racers. Briefing is at 11.00 with the first start at 13.00 NOR on the club website. Following last years trial, 2019 membership stickers will be available at the AGM. This will be a one night only deal of £15. Save yourself £5 and the association postage. Unfortunately a combination of injuries, weddings and a very light forecast resulted in a disappointing entry, but the sailors who did attend had some very close competitive racing, and by combining the event with the Contender class there was a reasonable number of boats on the water. As the boats rigged on Saturday morning there was 5 knots ENE and this was forecast to increase by the scheduled start time of 1300 hrs. As the forecast for Sunday was even lighter, the Race Officer made the (wise) decision to run 4 races on the Saturday afternoon in case Sunday dawned with very little wind. After a short hold on the beach, the fleet launched into about 8 knots NE and a strong flood tide. Race 1 got underway with everyone being cautious on the line, not wanting to be swept across and receive an OCS. At the windward mark it was Chris Shelton who lead, closely followed by Richard White and Simon Green. Richard showed some impressive speed on the reaches to take the lead by the leeward mark. In the meantime, following a poor start, Steve Popple had very good boat speed to windward in his brand new boat and was slowly catching the leading pack of three. On the second lap there was even more place changing with Simon staying the mix. However by the finish Chris had manged to get ahead again and Simon had overhauled Richard to take second. Race 2 followed a similar pattern, but this time it was Steve round the windward mark first. However Chris, Richard and Simon were not far behind and all 4 boats were continually changing places around the course. On the final triangle Chris managed to pull ahead again, but this time it was Richard second and Simon third. The start of race 3 saw Richard and Chris parked up on the start line which allowed Peter Harlow to cross the line at speed and into the lead. However by the windward mark the rest of the fleet had caught up and once again the merry-go-round of place changing started. By this time the tide had slacked and the wind had also dropped slightly. Working the shifts on the beats became more important, as did finding good pressure downwind. By the final triangle a similar pattern had emerged, Chris in front, Simon second this time and Richard third. The ebb tide had kicked in by the time race 4 started and this resulted in the boats taking a long starboard tack course to stay further inshore. At the windward mark Simon and Chris arrived simultaneously on port, but crucially Chris was inside as both boats tacked and was first onto the reach. Richard and Peter were not far behind in that order. In contrast to all of the previous races, places stayed exactly the same for the duration of this race. The ebb tide gave less choice of routes on the windward legs and the distance between the boats slowly increased as the race progressed. It had been a long afternoon on the water, and the sailors gratefully returned to shore ready for the free evening meal in the clubhouse. The meal was accompanied by live music from the popular Jackson Bell Duo and plenty of liquid refreshment. Unfortunately Sunday morning dawned precisely as forecast with the occasional 2 knot Easterly in-between periods of flat calm. However all was not lost as the competitors tucked into a full English as the AP was hoisted. The Race Officer announced that the wind was forecast to increase (slightly), and he was going to take advantage of the short slack water period due about 11.00 am. However the wind was a little late arriving and by the time race 5 started about 11.30 the flood tide had already started. Simon Green made a cracking start on port and was soon ahead on the long slow port tack beat against the tide. Richard was second with Chris uncharacteristically in third. The boats remained in this formation until the first reach where once again Richard showed his downwind speed to overhaul Simon. By the time the second beat started the wind was back down to about 3 knots and the tide was getting stronger. This meant that almost the whole windward leg was spent on port tack lee-bowing the tide, with the boats staying in the same positions. After a long, slow run the competitors were grateful to see the Shorten Course signal, with Richard crossing the line first, Simon second and Chris third. As the wind was showing no signs of improving, and the tide was getting stronger, race 6 was cancelled and the competitors returned to shore to be greeted by the Band of the Royal Marines playing at the bandstand and a Spitfire fly-over. Congratulations must go to Race Officer Steve Restall for getting in five races over a difficult weekend. Thanks also to all of the Downs Sailing Club volunteers who gave up their time over the weekend to man the safety boats, beach-party, canteen, bar etc. to make the event a success. Downs SC (Deal, Kent) once again welcomes all Phantom sailors to their Open Meeting on 14th / 15th July. There will be 3 races on Saturday afternoon (first start at 1300) and a further 3 races on Sunday (first start 1000). Food will be available on arrival and a Saturday evening meal is included in the entry fee. (click on "Open Meetings" in the left hand menu column). This is great opportunity to get some practice on the open sea before the Nationals in September. Come to Deal to experience our unique "sledges" and some great sailing. The grass had been cut, starting hut painted, engines serviced, beer bought and food prepared. 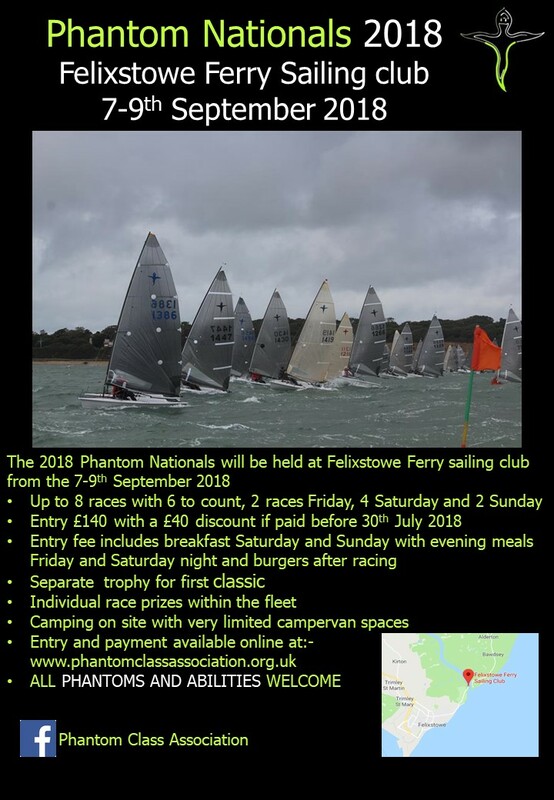 All was ready for another classic open meeting for the Phantom Eastern series at Creeksea Sailing Club in deepest Essex over the weekend of 16th/17th June. Nineteen boats entered the two day event, racing under the watchful eye of race officer Edwin Buckley ably assisted by his wife Pat. The large home fleet was out in force with 10 boats entered (and a further two displaying “dual nationality”) looking forward to competing with the best from Northampton, Royal Harwich, Stone, Oulton Broad, Up River and Alton Water. The wind god’s had once again smiled on the club and made sure that they were not to go without breeze over the whole weekend. Saturday’s South Westerly built during the day and this direction gave Edwin a tough job in getting the fleet away from the club line. Employing a temporary mark in Race 1 and 2 gave a challenge to the fleet in deciding whether to risk the tide with a fetch to the mark or benefit from slacker tide and a tighter beat. Surprisingly the fleet spread out well for the start and battled strong gusts approaching and exiting the mark which required a bear away gybe. Early victims included Bob Portway who had been in second place at the mark. The race then reverted to the default setting of a reach to the Cliff mark close to the entrance to Althorne Marina and a beat up river to the Canewdon mark on the south bank of the river. This stretch of the River Crouch presents a challenge in wind over tide conditions and as the day progressed both wind and tide built and it was inevitable that challenging conditions would develop. The downwind legs back to the club line saw a classic tacticians dilemma that was also to be a feature of the weekend. Crossing the river to hug the northern bank was the obvious choice but when and where to cross over were the hard choices. Race one saw John Wayling resume his past form at Creeksea by playing things just right and holding off Matt House and Chris Roberts to take the gun. The decision where to cross the river again played a crucial role in deciding the winner in Race 2, where up and coming local sailor Roger Smith defied the usual convention by crossing the river early after rounding Black Point, to reach home along the shore whilst the leading group of boats looked on in horror. A well deserved first open meeting race win by the ever humble Smith who attributed his astute tactical analysis to the need to clear weed from his rudder. As if…. Lunch in the “pop up” galley was enjoyed in glorious sunshine with a veritable banquet provided by the club. Race three saw a further variation upon the theme – a fast reach to Cliff and a tough beat up to Canewdon with a repeat of this gruelling beat sorting the men from the boys. Bob Portway showed that he had recovered from his earlier mishap, with a win from Wayling and Ben Falat. Returning ashore the fleet showered and pampered in the beautifully refitted showers and enjoyed the free beer provided by the home fleet. Barrel 1 was swiftly disposed of as tactics, rules and tuning tips were debated at length. The home fleet is sponsored by the Polash Indian Restaurant in Burnham and an excellent meal was enjoyed by all at their establishment. A night cap in the Queens Head before carriages were called rounded of the evening. Sunday dawned grey with light rainfall. Not what had been ordered but this soon passed and the day developed with more sun and slightly less wind evident to the relief of many. Similar courses were necessary for the day as the breeze refused to follow the forecast and stuck in a general South Westerly direction. In what seems to be something of a habit for day two of the Creeksea Open meeting, Chris Roberts got a grip on race one and he and former club mate Marcus Ingram, sailing Rod Thorpe’s beautiful JJ boat, had a close race at the front of the fleet before Roberts made the decision to cross the river early and left the fleet strung out behind him to score a win for the home fleet. Race five again provided another suprise with a win for Ben Falat as John Wayling who had led from start to finish was judged to have been OCS. The astute reader will realise that at this point after ffive races there were five different winners and the closeness of the racing was evident throughout the fleet. Lunchtime saw a fair bit of calculation work amongst the leading boats. John looked likely to win but it was very close between the four following boats of House, Portway, Falat and Roberts. The final race saw the breeze build a little and the reversion to the double beat to Canewdon tested the endurance of the fleet. Special mention has to go to Warren Martin sailing his newly acquired boat who sped away from the line to develop a commanding lead on the reach to the Cliff mark only to fall back upwind. 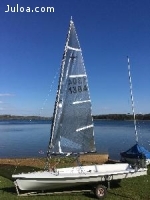 The Creeksea Phantom Sailing Academy will be dishing out more homework on upwind technique next term for this promising new boy. Having been stung by the denial of a victory in Race 5 John Wayling, however, made few mistakes to take the gun from Portway. This secured the same results overall for them as a consequence. Falat followed them home in third place to secure his fourth overall position, whilst House and Roberts were buried mid fleet. After the application of two discards House took third overall and Roberts fifth. Special thanks were made to the race officer and rescue boat crews. 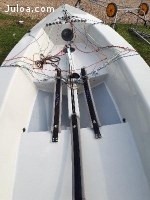 The single handed recovery of a dismasted Phantom by Finn sailor Keith Fedi manning the Safety boat was masterly and after minor work on Sunday Pete Sarbut was back on the water to fight again. A special mention also goes to Alan Shrimplin who once again took some superb photos on Sunday morning but could barely keep awake for the rest of the day having returned from an overseas holiday early that morning! The next event in the Phantom Eastern Series is at Royal Harwich Yacht Club on the 14th / 15th July. This weekend we are at the venue of next years Nationals for an open meeting shared with the Aero class. Registrtion is between 10.00 and 12.30 on Saturday with the first race at 13.00 and 3 races scheduled each day, notice of race can of course be found on the club web site www.lossc.co.uk , triangle/sausage course with a view of the Isle of Wight I'm informed. And if anyone wants to arrive on Friday evening please contact Gordon at the club or class forum to make arrangements. Entry is £25 and an an evening meal will be available at £8 from the excellent galley. So come and familiarise yourself this weekend and give yourself an advantage for 2019 Nationals ! !